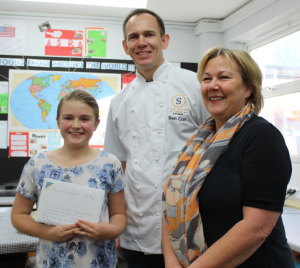 On Saturday 18 November The Market Weighton School hosted the first round of The Rotary Club’s Young Chef Competition 2017. 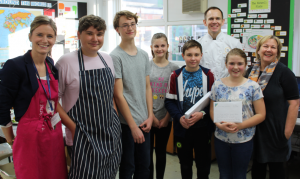 Five aspiring young chefs aged between 12-15 years old, studying Food & Nutrition at TMWS, went head to head under the watchful eye of ex pupil and Head Judge, Ben Cox of The Star at Sancton. The brief was to create a three course meal for two with a focus on healthy eating. The chefs had a modest budget of £15 and had just two hours to complete and present their creations. They were judged on menu balance, final taste, presentation, table setting, competence and skill, personal and kitchen hygiene. This all produced an exceptional array of cuisine from all the contestants which would satisfy any restaurant diner. It proved to be an extremely close contest. The winning menu of moules mariniere, poached chicken breast with a herb cream cheese filling wrapped in pancetta served with heritage carrots, baby potatoes and mange tout with a white wine and mushroom sauce, followed by a chocolate and raspberry roulade went to Alex Calvert of Year 8. Alex was rewarded with a day’s mentoring at the Yorkshire Wolds Cookery School and will now go on to cook in the district final at Betty’s Cookery School in York in her quest to reach the National Final later next year. Head Judge, Ben Cox said “The menu Alex created was well balanced and extremely accomplished, especially for someone so young.” He wished her all the success for the next round. 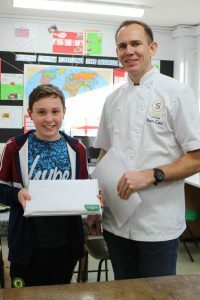 In second place was Harry Hawkett, also Year 8, who cooked a pear and goats cheese open quesadilla with rocket salad and balsamic dressing, followed by fillet of salmon en croute, hassle back potatoes and minted pea puree. His dessert was a blackberry and apple crumble with pouring cream. Harry was rewarded with a cookery book which Head Judge Ben Cox personally signed. Congratulations go to the runners up: Evie Casemore, Jamie Ewbank and Jacob Smith who also produced three fantastic courses. Thank you to Carol Watson, President of Weighton Wolds Rotary Club, for presenting the prizes.